Take a minute to think about the last time you told someone that you felt “stressed out.” How did you feel? Did you feel tense, as if every muscle was tight, every nerve on edge? Were your palms sweaty and your stomach in knots? Was your heart pounding and did you have a lump in your throat? Did you have trouble sleeping or always feel exhausted no matter how much sleep you had the previous night? What was going on in your life at that time? Were you preparing for a big exam? Was a family member’s illness causing you to worry? Did you feel torn between the demands of family, work, and school? Were you worried about your financial state, wondering how you would cover some large unexpected expense? Were you about to change jobs or were you going through a divorce? How you manage these and other stressors is critical to your well-being. During the Middle Ages and for much of the next 200 or 300 years, people viewed the mind and body as separate entities. In the last third of the twentieth century, however, medical science began to give increasing scrutiny to how the mind and body work together and influence each other. In fact, today it would be hard to find anyone who denies that there is a connection between mind and body or that stress plays a role in illness. Stress is a widely used term in today’s society. It is derived from a word used in the 1600s (stress, a variation of distress), which meant acute anxiety, pain, or sorrow. Today, doctors and psychologists generally define stress as a state of physical and/or psychological arousal to a stimulus. Any stimulus is capable of being a stressor for someone, and stressors vary from individual to individual and from time to time. Many agree that stress poses a potential hazard for EMS personnel. However, it is important to recognize that stress is a normal part of life and, when managed appropriately, does not have to pose a threat to your well-being. As an EMT you will be routinely exposed to stress-producing agents or situations. These stressors may be environmental factors (e.g., noise, inclement weather, unstable wreckage), your dealings with other people (e.g., unpleasant family or work relationships, abusive patients or bystanders), or your own self-image or performance expectations (e.g., worry over your expertise at specific skills or guilt over poor patient outcomes). Ironically, these stress-causing factors may be some of the same things that first attracted you to EMS, such as an atypical work environment, an unpredictable but varied work load, dealing with people in crisis, or the opportunity to work somewhat independently. How you manage these stressors is critical to your survival as an EMS provider as well as in life. Dr. Hans Selye (a Canadian physician and educator who was born in Austria) did a great deal of research in this area and found that the body’s response to stress (general adaptation syndrome) has three stages. During the first stage (alarm reaction), your sympathetic nervous system increases its activity in what is known as the “fight-or-flight” syndrome. Your pupils dilate, your heart rate increases, and your bronchial passages dilate. In addition, your blood sugar increases, your digestive system slows, your blood pressure rises, and blood flow to your skeletal muscles increases. At the same time, the endocrine system produces more cortisol, a hormone that influences your metabolism and your immune response. Cortisol is critical to your body’s ability to adapt to and cope with stress. In the second stage (stage of resistance), your body systems return to normal functioning. The physiologic effects of sympathetic nervous system stimulation and the excess cortisol are gone. You have adapted to the stimulus and it no longer produces stress for you. You are coping. Many factors contribute to your ability to cope; these include your physical and mental health, education, experiences, and support systems, such as family, friends, and co-workers. Exhaustion, the third stage of the general adaptation syndrome, occurs when exposure to a stressor is prolonged or the stressor is particularly severe. During this stage, the physiologic effects described by Selye include what he called the stress triad: enlargement (hypertrophy) of the adrenal glands, which produce adrenaline; wasting (atrophy) of lymph nodes; and bleeding gastric ulcers. At this point the individual has lost the ability to resist or adapt to the stressor and may become seriously ill as a consequence. Fortunately, most individuals do not reach this stage. Three types of stress reactions are commonly encountered: acute stress reactions, delayed stress reactions, and cumulative stress reactions. Any of these may occur as a result of a critical incident, which is any situation that triggers a strong emotional response. An acute stress reaction occurs simultaneously with or shortly after the critical incident. A delayed stress reaction (also known as posttraumatic stress disorder) may occur at any time, days to years, following a critical incident. A cumulative stress reaction (also known as burnout) occurs as a result of prolonged recurring stressors in our work or private lives. Acute stress reactions are often linked to catastrophes, such as a large-scale natural disaster, a plane crash, or a co-worker’s line-of-duty death or injury. Signs and symptoms of an acute stress reaction will develop simultaneously or within a very short time following the incident. They may involve any one or a combination of the following areas of function: physical, cognitive (the ability to think), emotional, or behavioural. These are signs that this particular situation is overwhelming your usual ability to cope and to perform effectively. It is important to keep in mind that they are ordinary reactions to extraordinary situations. They reflect the process of adapting to challenge. They are normal and are not a sign of weakness or mental illness. Some of these signs and symptoms require immediate intervention from a physician or mental health professional, whereas others do not. As a rule, any sign or symptom that indicates an acute medical problem (such as chest pain, difficulty breathing, or abnormal heart rhythms) or an acute psychological problem (such as uncontrollable crying, inappropriate behaviour, or a disruption in normal, rational thinking) are the kinds of problems that demand immediate corrective action. These are the same kinds of problems that alert us to a potentially dangerous situation when we see them in a patient, and they should trigger the same response when exhibited by us or our co-workers. Helping people is not just about taking care of your patient; it is also always about taking care of each other and yourself. As previously mentioned, some signs and symptoms associated with an acute stress reaction may not require intervention. For instance, you may feel nauseated, tremulous, or numb after working a cardiopulmonary arrest, particularly if your patient is close to your age. You may feel confused or have trouble concentrating or difficulty sleeping after working at a particularly bloody crash scene or a prolonged extrication. You may find that you have no appetite for food or cannot get enough to eat. If not too severe or long-lasting, these responses are uncomfortable but probably not dangerous, since they pose no immediate threat to your health, safety, or well-being. Remember that you are not losing your mind if you exhibit signs and symptoms of stress after a critical incident. You are merely reacting to an extraordinary situation. Remember, too, that there is nothing wrong with you if you do not experience any symptoms after such an incident. This, too, is common. In other words, a wide range of responses is normal and to be expected. Like an acute stress reaction, a delayed stress reaction, also known as posttraumatic stress disorder (PTSD), can be triggered by a specific incident; however, the signs and symptoms may not become evident until days, months, or even years later. This delay in presentation may make it harder to deal with the stress reaction since the individual has seemingly put the incident behind him and moved on with his life. Signs and symptoms may include flashbacks, nightmares, feelings of detachment, irritability, sleep difficulties, or problems with concentration or interpersonal relationships. It is not uncommon for persons suffering from PTSD to seek solace through drug and alcohol abuse. Because of the delay and the apparent disconnect between the triggering event and the response, the patient with PTSD may not understand what is causing the problems. PTSD requires intervention by a mental health professional. Cumulative stress reaction, or burnout, is not triggered by a single critical incident, but instead results from sustained, recurring low-level stressors possibly in more than one aspect of one’s life and develops over a period of years. The earliest signs are subtle. They may present as a vague anxiety, progressing to boredom and apathy, and a feeling of emotional exhaustion. If problems are not identified and managed at this point, the progression will continue. Now the individual will develop physical complaints (such as headaches or stomach ailments), significant sleep disturbances, loss of emotional control, irritability, withdrawal from others, and increasing depression. Without appropriate intervention, the person’s physical, emotional, and behavioural condition will continue to deteriorate, with manifestations such as migraines, increased smoking or alcohol intake, loss of sexual drive, poor interpersonal relationships, deterioration in work performance, limited self-control, and significant depression. At its worst, cumulative stress may present as physical illness, uncontrollable emotions, overwhelming physical and emotional fatigue, severe withdrawal, paranoia, or suicidal thoughts. Long-term psychological intervention is critical at this stage if the individual is to recover. The ultimate key to preventing or managing cumulative stress lies in seeking balance in our lives. Multiple-casualty incidents. A multiple-casualty incident (MCI) is a single incident in which there are multiple patients. Examples range from a motor-vehicle crash in which two drivers and a passenger are injured to a hurricane that causes injuries to hundreds of people. Calls involving infants and children. Involving anything from a serious injury to sudden infant death syndrome (SIDS), these calls are known to be particularly stressful to all health care providers. Severe injuries. Expect a stress reaction when your call involves injuries that cause major trauma or distortion to the human body. Examples include amputations, deformed bones, deep wounds, and violent death. Abuse and neglect. Cases of abuse and neglect occur in all social and economic levels of society. You may be called to treat infant, child, and adult, or elder abuse victims. Death of a co-worker. A bond is formed among members of the public services. The death of another public-safety worker even if you do not know that person can cause a stress response. Stress may be caused by a single event or it may be the cumulative result of several incidents. Remember that any incident may affect you and your co-workers differently. Two EMTs on the same call may have opposite responses. Try never to make negative judgments about another person’s reaction. Stress may also stem from a combination of factors, including problems in your personal life. One common cause of stress is people who “just don’t understand” the job. For example, your EMS organization may require you to work on weekends and holidays. Time spent on call may be frustrating to friends and family members. They may not understand why you cannot participate in certain social activities or why you cannot leave a certain area. You might get frustrated, too, because you cannot plan around the unpredictable nature of emergencies. Then, after a very trying or exciting call, for instance, you may wish to share your feelings with a friend or some-one you love. You find instead that the person does not understand your emotions. This can lead to feelings of separation and rejection, which are highly stressful. There are two types of stress: eustress and distress. Eustress is a positive form of stress that helps people work under pressure and respond effectively. Distress is negative. It can happen when the stress of a scene becomes overwhelming. As a result, your response to the emergency will not be effective. Distress also can cause immediate and long-term problems with your health and well-being. The signs and symptoms of stress include irritability with family, friends, and co-workers; inability to concentrate; changes in daily activities, such as difficulty sleeping or nightmares, loss of appetite, and loss of interest in sexual activity; anxiety; indecisiveness; guilt; isolation; and loss of interest in work. Develop more healthful and positive dietary habits. Avoid fatty foods and increase your carbohydrate intake. Also reduce your consumption of alcohol and caffeine, which can have negative effects, including an increase in stress and anxiety and disturbance of sleep patterns. Exercise. When performed safely and properly, exercise helps to “burn off” stress. It also helps you deal with the physical aspects of your responsibilities, such as carrying equipment and performing physically demanding emergency procedures. Devote time to relaxing. Try relaxation techniques, too. These techniques, which include deep-breathing exercises and meditation, are valuable stress reducers. In addition to the changes you can make in your personal life to help reduce and prevent stress, there also are changes you can make in your professional life. If you are in an organization with varied shifts and locations, consider requesting a change to a different location that offers a lighter call volume or different types of calls. You may also want to change your shift to one that allows more time with family and friends. Critical incident stress management (CISM) is a comprehensive system that includes education and resources to both prevent stress and to deal with stress appropriately when it does occur. EMS systems and organizations have different systems for dealing with stress prevention, critical incident stress, and chronic stress, including wellness incentives, professional counselling, and peer support. 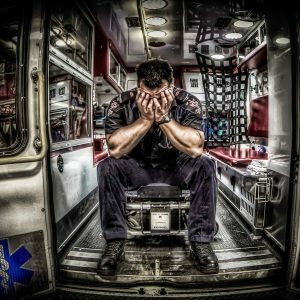 Medical professionals and EMS leaders agree that the best course of action for an EMT who is experiencing significant stress from a serious call or experience is to seek help from a mental health professional who is experienced in treating these issues. Everyone responds to these stresses differently. Some may go on the most serious calls and seemingly be unaffected whereas others have deep emotional reactions to such calls. Most important, remember that seeking care is not a sign of weakness. Many professionals can help you deal with stress, and much of the care may be covered by health insurance policies or employee assistance programs. The critical incident stress debriefing (CISD) model is a process in which a team of trained peer counsellors and mental health professionals meet with rescuers and health care providers who have been involved in a major incident. The meetings are generally held within 24 to 72 hours after the incident. The goal is to assist emergency care workers in dealing with the stress related to that incident. Sometimes a “defusing session” is held within the first few hours after a critical incident. Although CISD includes all personnel involved in the incident, a defusing session is usually limited to the people who were most directly involved with the most stressful aspects. It provides them an opportunity to vent feelings and receive information before the larger group meets. The CISD (debriefing/defusing) model is now used less frequently and is not recommended by many in EMS and mental health professions. As an EMT, you will undoubtedly be called to patients who are in various stages of a terminal illness. Understanding what the families and the patients go through can help you deal with the stress they feel as well as your own. When a patient finds out that he is dying, he goes through emotional stages, each varying in duration and magnitude. These sometimes overlap, and all affect both the patient and the family. Denial or “Not me.” The patient denies that he is dying. This puts off dealing with the inevitable end of the process. Anger or “Why me?” The patient becomes angry at his situation. This anger is commonly vented upon family members and EMS personnel. Bargaining or “Okay, but first let me….” In the mind of the patient, bargaining seems to postpone death, even for a short time. Depression or “Okay, but I haven’t….” The patient is sad, depressed, and despairing, often mourning things not accomplished and dreams that will not come true. He retreats into a world of his own, and is unwilling to communicate with others. Acceptance or “Okay, I’m not afraid.” The patient may come to accept death, although he does not welcome it. Often, the patient may come to accept the situation before family members do. At this stage, the family may need more support than the patient. Not all patients go through all these stages. Some may seem to be in more than one stage at the same time. Some reactions may not seem to fit any of the described stages. Those who die rapidly are likely not to have such a predictable response to their own mortality. However, a general understanding of the process can help you to communicate with patients and families effectively. As an EMT, you will also encounter sudden, unexpected death; for example, as a result of a motor-vehicle collision. In cases of sudden death, family members are likely to react with a wide range of emotion. Recognize the patient’s needs. Treat the patient with respect and do everything you can to preserve the patient’s dignity and sense of control. For example, talk directly to the patient. Avoid talking about the patient to family members in the patient’s presence as if the patient were incompetent or no longer living. Be sensitive to how the patient seems to want to handle the situation. For example, allow or encourage the patient to share feelings and needs, rather than cutting off such communications because of your own embarrassment or discomfort. Respect the patient’s privacy if he does not want to communicate personal feelings. Be tolerant of angry reactions from the patient or family members. There may be feelings of helpless rage about the death or prospect of death. The anger is not personal. It would be directed at anyone in your position. Listen empathetically. Although you cannot “fix” the situation, just listening with understanding and patience will be very helpful. Do not falsely reassure. Avoid saying things like “Everything will be all right,” which you, the patient, and the family all know is not true. Offering false reassurance will only be irritating or convey the impression that you do not really understand. Offer as much comfort as you realistically can. Comfort both the patient and the family. Let them know that you will do everything you can to help or to get them whatever help is available from other sources. Use a gentle tone of voice and a reassuring touch, if appropriate.